Merry Christmas! Thanks for many Doges! WOW such loss! You are here: Home / Barracuda / Merry Christmas! Thanks for many Doges! WOW such loss! BitCoin's popularity flourishes, along with the attention of attackers and vulnerabilities, alternative crypto-coin markets such as Litecoin have been attracting late comers to the Internet peer-2-peer crypto-currency mining business. An example of a Litecoin currency which recently joined the herd is Dogecoin. The term ‘doge' originated from the Internet meme where the Homestar Runner puppet show intentionally mis-spelled the word ‘dog'. Doge is pronounced “dohj”, but that's still an undecided upon argument. Dogecoin has been gaining in popularity because of the plentiful mining and exchange rates from LTC to BTC and/or USD that would attract anyone looking to make some low effort side coin. Dogecoin was introduced on December 6th, 2013 and since then has seen much popularity resulting in a DDOS of some pool services adversely affecting its exchange rate. Giving rise to its first major crash on December 22nd, 2013. Mining continued, in a rush to accumulate as much of the 100 billion dogecoins allocated and 18 days after its genesis approximately 12.5% have been collected. This much attention will attract all kinds of decent folk and cyber-scum the Internet has to offer. On December 25th, 2013 Dogecoin and its patrons are now amongst the infiltrated and robbed in the digital wallet world. While many of us were taking the day off, spending time with friends and family, the cyber-criminals were hard at work emptying digital wallets. 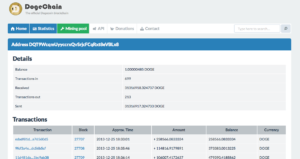 As shown from the Dogecoin forum posts, it appears hundreds of transactions, large and small, have funneled into a cyber-criminal's digital wallet with the address (DQT9WcqmUyyccrxQvSrjcFCqRxt8eVBLx8). One would believe that all transactions are traceable and the organizers behind Dogecoin would be able to have enough information for the authorities. Dogecoin transactions to the suspected account. 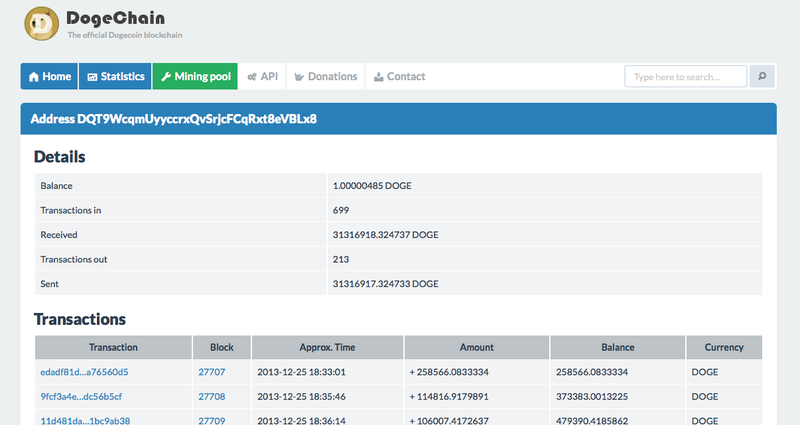 When looking solely at the received and sent transactions, including today, the total theft is about $20,033 USD based on the dogecoinpool's IRC channel exchange autoresponder aptly named, doge_bot. According to the Dogecoin.com official blog, a tweet was sent to inform victims and sympathizers of a Dogecoin donation being organized for the victims. Much nice. But it doesn't look like it will be enough to cover the 31M DOGES lifted at the time of this articles publication. Barracuda's advice to protect your financial interests include encrypting your wallet with very strong passwords, and if possible, use two-factor authentication. If that seems like too much effort for you, then your best bet is to stay out of the highly volatile and risky crypto-coin market. UPDATE: In the past 48 hours Dogecoin released two updates to address the threat issues. Now “investors” can protect themselves further with a patched upgrade. You can upgrade your wallet to the latest version 1.3 of the Dogecoin wallet that is stated to address the threat issue on Windows and Mac clients. Please refer to the Dogecoin forums for technical support.